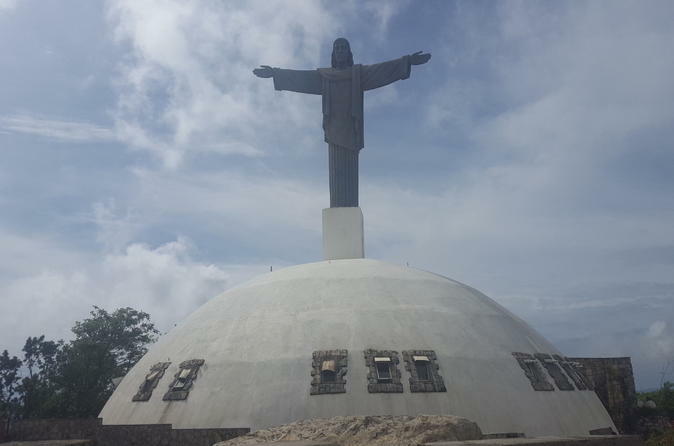 My bf and I visited Puerto Plata just this March 2019 and were very delighted at experience we received via the Eat, Drink and be Merry tour hosted by Alexander and his com padre Indian Jones! lol Our group was A FABULOUS FIVE, of absolutely the most wonderful people from all walks of life. We were treated with THE BEST of hospitality by our guides and were enlightened re: the city's historic sites as well as it's history. It will always be one heck of a memory for me! Thank you so much Alexander and Team. Alexander with Iguana Mama tours did an excellent job incorporating his knowledge of the area with a fun yet professional nature. Super enjoyable! Very good tour with Luiz/Louis, he was able to speak English, Spanish and German to accommodate the group of tourists. My girlfriend and I enjoyed the Christ the Redeemer statue, the rum factory tour and shop, the cigar factory, and Dominican lunch with drinks. Only issue we had was dealing with vendors near the Christ the Redeemer statue which Luiz/Louis warned us of. Other than that, it was a great tour and I would recommend it. The cable car ride was cancelled, but our tour guides made our experience a fun adventure. This tour was better than advertised. Our guide, Louis, was very knowledgeable and informative of the Dominican history and culture. They made sure that everyone on the tour was involved, whether it was playing traditional instruments or learning to dance. The view from the cable car on the way to the top of Mt. Isabella was spectacular. Lunch was amazing. And, most importantly don't forget the rum.... I would suggest this tour to everyone visiting the north coast of the Dominican Republic. We had an amazing experience on this city tour! It was just myself and my husband and it felt like we were being chaufferred around to different parts of Puerto Plata, DR. It was cool that the company didn't cancel on us just because it was only 2 people. This tour was definitely one of the highlights of our trip! The tour guide and driver that took us on 6/30/2017 from Blue Bay were AMAZING! They were courteous and attentive to our needs and wants. The tour guide was very informative and kind. The tour felt very personal and private. As we were driving through Puerto Plata to different things, the tour guide was giving lots of information about the history of Puerto Plata. We were lucky to have great weather on the way up and touring around the mountain area. It is a great area for pictures and it is beautiful from on top of the mountain. However, there are men that own or work in the shops under the statue and they take your pictures for you but know that they want you to go look in their stores to purchase things. The pictures the gentleman took were great. We took him up on his offer to go to his shop. His shop was well organized and nice. HOWEVER, be aware that he or they overcharge like crazy. He tried to charge us almost 75 for three bracelets that looking elsewhere, would cost us anywhere from 25-40 max to purchase. We talked him down to 40 which we thought was reasonable and ended up making a purchase. He was really pushy and a little too much and it almost ruined the trip. We can tell that he was upset that he wasn't getting the amount of money out of us that he wanted and was stand offish towards the end of the deal. We said thank you and he just stood there sulking that he didn't get the bargain he wanted out of us. We totally understand having to make a living but that doesn't mean you should charge unfair prices to your customers. It is a total ripoff and a turn off to want to get anything from your business. We were close to saying forget it you can keep your merchandise and we will shop elsewhere. However, other than that hiccup the rest of the trip was amazing. Again, dress appropriately as you will be having to do some walking and make sure you wear shoes that have good grips because the floor can be REALLY slippery. The cable car seems to run rain or shine. It started drizzling towards the end and it was still running. Know that if you go on a day where it is really cloudy or raining you may not even be able to see the statue while you are up there because of all the fog. Also, know that it is slightly cooler in the mountain area. This stop isn't too far from the cable car. The tour guide recommended that we stay away from anyone selling merchandise near the fort because they can be really pushy and inappropriate. We complied and kept walking to the fort. The location of the fort is absolutely stunning. We were making really good time and beat the traffic and the crazy amount of people that were on their way in as we were leaving. However, it is small so if there is a lot of people there you may feel a little overwhelmed. They give you a headset so you can learn about the history in the fort. Not too much to see to be honest. However, the location was beautiful and was the highlight We took a lot of great pictures. If you ever travelled to PR, know that the fort in Puerto Plata, DR is 1/10 of the size of PR's. Oh my GOD! I don't even know where to start. The food at the restaurant called Kaffe I believe that's the name was amazing. The atmosphere is amazing as well! The restaurant feels like home but also very decorative and unique. The waiter was really sweet and they don't hover over you. The tour guide and the driver came into the restaurant with us but sat separately. So for a moment we didn't even feel like we were on tour. We were able to enjoy each other's presence and engage in private conversations. It was great and a nice meal! We had the chicken and rice with a Guava fresh fruit drink. The meal was one of the best meals I had while in the Dominican Republic. I would definitely recommend and return back to the restaurant! HIGHLY RECOMMENDED! Delicious food and amazing atmosphere. We wish we spent a little more time in the cigar factory learning more about the process. That part felt a little rushed especially since it was the end of the tour or maybe there isn't that much to cigar making in general. However, it wasn't really what I envisioned to be a factory it was more like a store. The store was well organized and beautiful. All of the staff were kind and informative. They let us roll the cigar which was pretty fast but cool. I wish we would have been involved more in the process. We bought some cigars there which were reasonably priced! They also danced tipico and bachata for us and with us and it was a great end to the day!! I can't say how much we loved the guides in this tour! They were very informative and fun! Every time we got back in the bus they had more drinks ready for us and at the end the cigar rolling shop/dancing was one of our favorite things in this trip! and trees. We highly recommend this tour.